A comprehensively updated revision of a book regarded by many as one the leading and authoritative titles for practitioners, academics and students in the domain of information systems and technology (IS/IT) strategy. Presents a structured framework with tools, techniques and ways of thinking which provide a practical approach to building a digital strategy, expressed primarily in the language of business and management. Brings together the implications of the significant advances in IT and the most useful current thinking, research, and experiences concerning the business impact and strategic opportunities created by IS/IT. Peppard and Ward discuss the key questions that managers have to grapple with of where, when and how to invest in IS/IT, which is why a IS/IT (or digital) strategy is required. 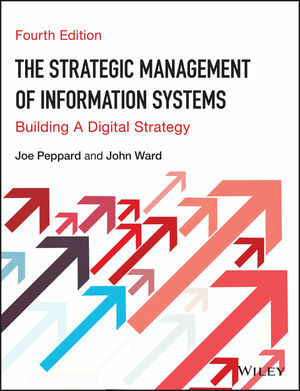 Joe Peppard and John Ward present a structured framework with tools, techniques and ways of thinking which provide a practical approach to building a digital strategy, expressed primarily in the language of business and management. This approach can be used by executives, managers and IS/IT professionals, working together, to combine their experience and skills to identify what can and needs to be done and how best to do it, so that IS/IT is managed strategically. The title has been changed from Strategic Planning for Information Systems to Strategic Management of Information Systems which is more relevant in terms of current business terminology and reflects more accurately what is required to successfully leverage information systems and technology. Helps the reader address the key questions of where, when and how to invest in new technologies. Considers how digital or IS/IT strategic management development can be brought about and then sustained. Provides a structured framework and practical approach, expressed primarily in the language of business and management. Peppard and Ward have numerous years’ experience as leading writers, researchers and educators in the field of information technology.